Ikom monolith, Calabar Museum, December 2006, originally uploaded by nobodaddy69. 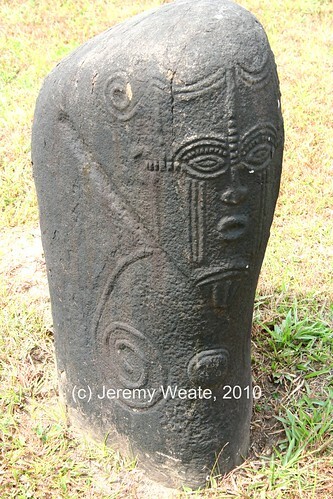 This stone is now in the grounds of the Calabar museum, but was originally sited at Ikom to the north. The Ikom Monoliths are each at least 2,000 years old if not much older. They are Nigeria's Stonehenge and show evidence of a writing tradition in West Africa from the time of Socrates and Aristotle.